It was hot that summer, the sun leaching colour from the grass, her hair turning blond. The cedar survived the drought though, 100 feet tall and the trunk too large for her arms to meet around it. Still she liked to press her cheek up against the bark, feel it breathe. One evening Alex built a bonfire, and she stood drinking with the others, trying to whoop as the sparks flew, pretending to laugh when the bird’s nest caught. Perhaps it was the hangover, but she couldn’t raise herself, couldn’t get out of bed the next morning to see the blackened stump. This is a 100-word Friday Fictioneers short story inspired by the picture above (the colour of the grass started it off), this week supplied by Jan Wisoff-Fields. Click here to join in, and here to read other people’s. My second novel, Swimming Lessons is currently available as a give-away on Goodreads to UK readers. Click here to enter. Inside the mausoleum we held our candles high. ‘Two wives?’ Cara said, her shadow moving between the three tombs. Back in January I was lucky enough to visit The Little Ripon Bookshop to sign some copies of Our Endless Numbered Days. I couldn’t have been made more welcome – coffee and biscuits, a little table by the door, a display of my books (and toothpaste, Spam and string) in the window, and a stream of customers who so clearly came because they love this little bookshop, its owners and staff. Here’s my interview with Gill, one of the owners. Lutyens & Rubinstein is a beautiful shop in Notting Hill, London, small, but filled with light because of the large front windows and high ceilings. I was lucky enough to be invited along to their book club after the members choose to read Our Endless Numbered Days. I have to declare an interest though before I get started with the interview. As well as owning the bookshop, the owners run a literary agency from the basement. (You’d never guess that half a dozen people are hidden behind some bookshelves down there – see if you can spot them.) And Lutyens & Rubinstein Literary Agency represents me. Elsie sits in her window and counts the walkers: the old man with the exuberant puppy, the couple – each with a baby strapped to their backs, the lone hiker with his map in a plastic sleeve. She counts them up the cliff, and she counts them back down. Only once has someone gone up and not returned. She’d watched and waited until it grew dark, and considered phoning the police. Eventually, she went up by herself, but the bench at the top was empty. Then, with a shaking torch she scoured the undercliff. They buried him the following week. This 100 word (or so) flash fiction is a Friday Fictioneers story (an online group of writers, who write stories each week posted and hosted by Rochelle Wisoff-Fields). Click here to join in, or here to read other stories. The picture this week is provided by Sandra Crook. There are currently two give-aways running for my novel, Our Endless Numbered Days, but I’m afraid they are both only for UK readers. One is for 10 copies of the UK paperback proof on Goodreads, and the other for one copy of the UK hardback edition and is hosted by a UK blogger. 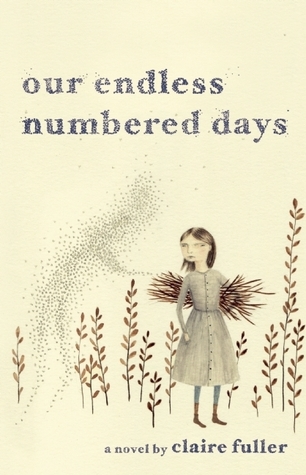 Claire’s debut novel, Our Endless Numbered Days, will be published in the UK by Fig Tree / Penguin (26th February 2015), in the US by Tin House (17th March 2015), and in Canada by House of Anansi, as well as publishers in The Netherlands, France, Italy, Taiwan, Turkey and Israel. After a dreadful argument which Peggy doesn’t fully understand until later, her survivalist father James, takes her from London to a cabin in a remote European forest. There he tells Peggy the rest of the world has disappeared. And so her life is reduced to a piano which makes music but no sound, a forest where all that grows is a means of survival and a tiny wooden hut that is Everything. If you like the sound of that, and you’re on Goodreads, you can add Our Endless Numbered Days to your ‘to read’ list, here, drop Claire a line from her contact page, or subscribe to her mailing list for updates about events and news.